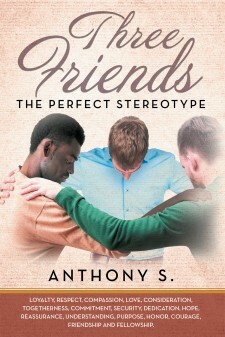 Anthony S.'s New Book "Three Friends...The Perfect Stereotype" is a Compelling Story of Lifelong Friendship and Acceptance, Until Something Goes Horribly Wrong. Mesquite, TX, February 14, 2018	(Newswire.com) - Anthony S., a dedicated writer and gifted author, has completed his most recent book “Three Friends...The Perfect Stereotype”: a relatable and charismatic story that revolves around a trio of friends that begins in grade school and continues into their adult lives. A boy’s night out begins in innocent fun and takes a staggering and unexpected turn. Published by Fulton Books, Anthony S.’s book is about three guys of different cultures who had known each other since the third grade. These guys have been supportive of one another ever since then. If one of them is violated, they all answer the call, and the perpetrator faces severe consequences. This was loyalty at its best. They were inseparable. Now in their twenties, the guys have developed some history among themselves. Experiencing tragedy, loss of life, breakups, etc. Being supportive when it was necessary. At this time in their lives, they now have families and responsibilities that are required of them. They all have conflicting schedules, which has not allowed them to see each other as much as they would have liked to. They have not had the opportunity to sit down together to have a cold beer in quite some time. One particular spring day, they found the time. Communicating back and forth with each other, they finally made plans to all meet at one of the other’s house, telling their significant others not to include them in any plans that Friday night. This night was set aside for the trio. The trio enjoyed each other’s company as the evening progressed. Utilizing the valuable time spent, they engage in watching a basketball game on the big screen. There was no one else there except the three. They were exclusive to the outside world. Later, they all were feeling a good buzz from the beer and liquor they consumed throughout the day and night, laughing and enjoying themselves to the fullest. There was a shift of events nonetheless. Something went wrong inside. Very wrong indeed. Readers who wish to experience this intriguing work can purchase “Three Friends...The Perfect Stereotype” at bookstores everywhere, online at Amazon, Barnes and Noble, Google Play, the Apple iTunes store, or by visiting www.fultonbooks.com. The book is available in paperback, hardcover, and eBook versions. The author also invites readers to leave a review of his book online. This can be done by typing the title in the search box on the website of the retailer where their copy was purchased. Anthony S.’s next book, “Bikers’ Loyalty”, will be coming soon.